Part station wagon, part crossover SUV, the 2015 Honda Crosstour creates its own unique niche. Serving as a more functional variation of the Honda Accord platform, the Crosstour offers the option of all-wheel drive (AWD), more ground clearance and a more versatile cargo bay. Controversial styling aside, the Crosstour may be the only real alternative to the popular Subaru Outback. Great car, only a few things I would change. The car has a lot of room in the back seats. The trunk has lots of room for putting groceries, suitcases etc.. The cameras are good for backing up and turning right or merging right. The problems with this car is that the turning radius is not very good for parking in tight parking spots. Also the radio is hard to use. The Bluetooth does not automatically connect and you have to manually do it. I love my 2015 Honda Crosstour. It is actually my second Crosstour, I had a 2012 before my current one. It is reliable and provides this right amount of room for my family of 3. I like that it sits higher than the Accord (which I have owed 2 of and loved). Very reliable, can be used for multiple needs and situations with style and performance. I bought it new when the test drive got me home during a snowstorm. Very reliable with many standard and efficient features. Nice to look at, fun to drive, and handles like a sports car. 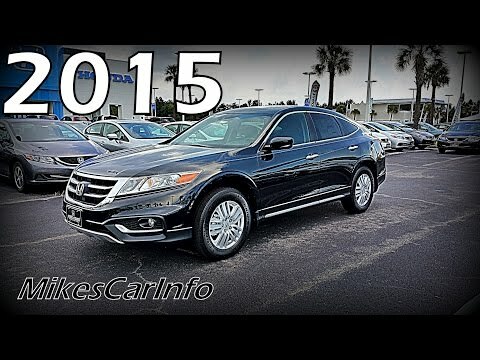 American Honda Motor Co. (Honda) is recalling certain model year 2015 Crosstour 4 Cylinder vehicles manufactured October 1, 2014, to November 4, 2014, Crosstour V6 2WD vehicles manufactured September 30, 2014, to November 13, 2014, and Crosstour V6 4WD vehicles manufactured September 30, 2014, to November 18, 2014. The inflator tube for the side curtain air bag may have been incorrectly manufactured. If the side curtain air bag does not properly inflate, it can affect the performance of the air bag in the event of a vehicle crash, increasing the risk of occupant injury. Honda will notify owners, and dealers will replace the left and/or right side curtain air bags, free of charge. The recall begn January 30, 2015. Owners may contact Honda customer service at 1-310-783-2000. Honda's number for this recall is JN0, JN1, and JN3.